Wow! Interesting picks, I so need them all. That golden water bottle is so fun! I love that gold Swell bottle. I have a navy blue one, but gold (or maybe rose gold) might be my next one! I love it, these are such awesome items, I love the gold swell I've had my eye on that one! These are all great picks! I really want to read that book, and I love the Swell bottle! Cute ideas! Like everyone else I love the water bottle too! These are all such amazing items! I want them all! The gold swell bottle has been on my wish list for a while but now so is that clutch, the fuzzy sleep mask and the coffee kit. I have to pin this to give my hubby some ideas. What a great gift guide! I love all of it and I think I might need one of those mugs! That clutch organiser is the best thing I have ever seen. I am going to have to add that to my Christmas list! Fab girl boss round up! I need it all! Love that charger and that adorable furry eye mark! Just so fun! Great gift ideas. The sleep mask and gold water bottle are must haves! Might get one for myself. Great round up of items!!! I love that clutch and mug!!! Love all of your picks! I die over that Swell bottle! Love this gift guide so much! So many awesome ideas for kickass friends! Ok I totally need to buy that fuzzy sleep mask for myself haha! Such a cute gift guide! I love all of these picks, everything is so pretty!! I've had those candles on my wish list for like 3 years but I haven't bit the bullet and got one! They're so expensive but everyone swears they're worth it! Love these ideas! I'm always on the lookout for fun girl boss ideas. I absolutely love your picks! Everything I would want too! Ooh my goodness. The organizer and the candles are my absolute favorite. Fabulous assembly of gifts! This is THE ideal gift guide...I'll be sending this to my boyfriend haha ;) That portable charger is an absolute must! These gifts are so cute! I love the diptyque candles and the swell bottle! How cute are those costars?? Love love love! 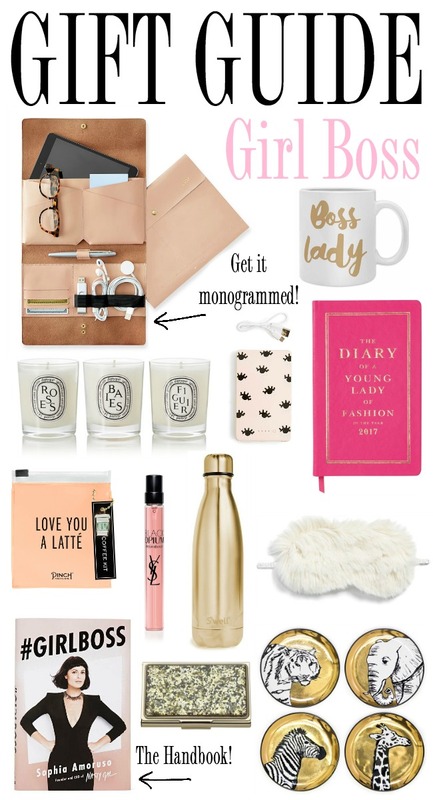 I pretty much need everything in this gift guide! All such great ideas! Loving those coasters. Oh that tech wallet is so cool! I love it. Those coasters are amazing! I think I need them. All these gifts are so great! I love that mug. And I have a Swell bottle and it's the best! It doesn't sweat at all so you never get wet hands. I didn't know they sold it in gold so I think I'm gonna have to add it to my list! That clutch organizer is brilliant! Literally love everything on this list. I love the card holder and the Swell water bottle. I love finding new business card holders. I currently have a super cute pink one, but a blue pen exploded on it...so I'm in need of a new one now! That clutch organizer is awesome! So many great ideas! I would never say no to a Swell bottle! I read GirlBoss and I absolutely adored it. Great choices! I basically want all of these. Oh man, I really love that clutch organizer! Definitely putting that on my list! So many great ideas! I need that clutch organizer. Adding it to my Christmas list as we speak! I want everything on this list!!! I'm ALWAYS buying new candles, those are my #1! That organizer would be so handy! Love the gold accents on the gifts! I LOVE THIS ENTIRE LIST!!!! :) This was spot on.